Do you want to get your weather charts without using an internet connection or a dedicated computer? 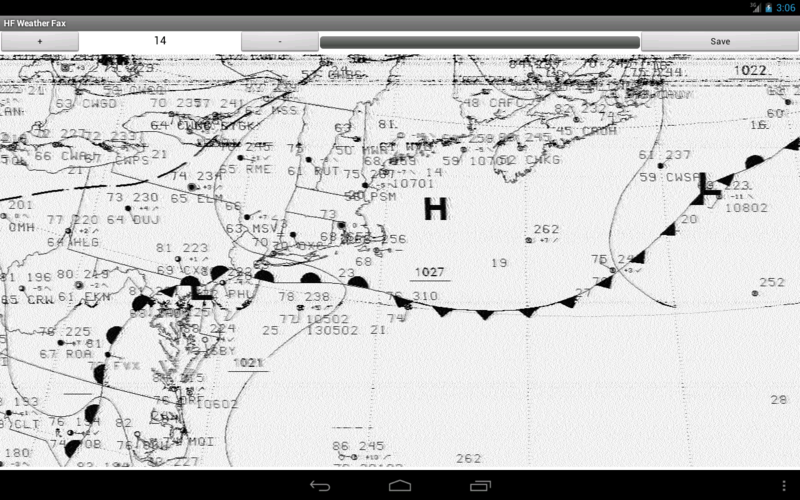 HF Weather Fax lets you receive marine weather radiofascimile transmissions on your Android device, using the audio from your HF marine radio. Just set it next to the radio's speaker or headphones, tune in a weather fax frequency, and watch the images come in. 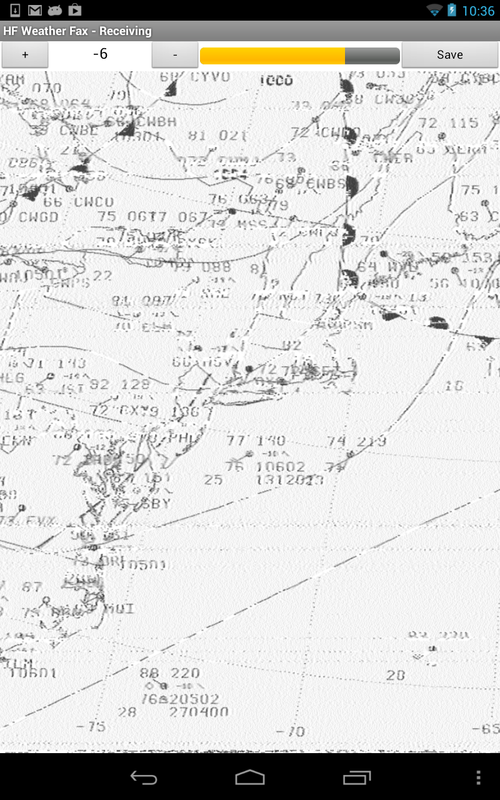 HF Weather Fax is perfect for mariners who want to be able to view the latest weather reports and forecasts. Received fax images can be manually or automatically saved, and viewed later. Buy your copy right now, and start decoding and displaying weather fax transmissions in minutes. 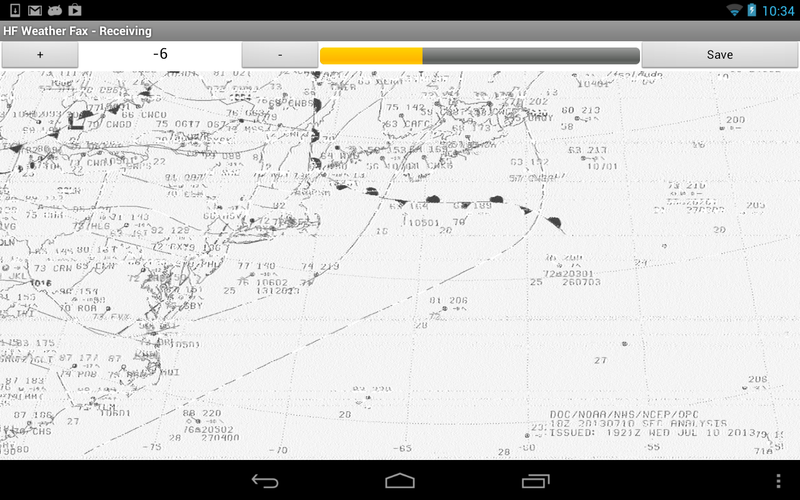 HF Weather Fax lets you receive marine weather radiofascimile transmissions on your Android device, using the audio from your HF marine radio. Just set it next to the radio's speaker or headphones, tune in a weather fax frequency, and watch the images come in. Received fax images can be manually or automatically saved, and viewed later. 1. Set the device near the radio's speaker to pick up the audio. While easy to do, this is not ideal, as background noise can interfere with the audio, causing garbled decodes. 2. Plug headphones into the radio, and set one earphone near the mic. I find that with good quality headphones, this can work extremely well. 3. Use the microphone input jack of your device, by obtaining an appropriate cable and connecting the radio's line level output to the microphone input. You can use the volume indicator at the top of the screen to verify that audio is getting into your device, and that the volume level is appropriate. When the app is launched, it will be in Idle mode, waiting for the start tone (which sounds like a loud buzzing) to be transmitted, indicating that a fax image is starting. When the start tone is detected, the app will next go into phasing mode, where it will lock on to the fax image, so it is correctly centered on the screen. Then it will be go into Receiving mode, decoding and displaying the fax image line by line as it is sent. When the end tone (another loud buzzing) is detected, receiving will stop, and the fax will be automatically saved, if Auto Save was selected in the app Settings. The app will then go back into Idle mode, waiting for the next Start tone. When first using the app, it is normal for the received image to be slightly slanted, due to slight audio timing variations between devices. This can be corrected by the timing adjustment value, which is located at the top of the screen between the - and + buttons. First tune in a fax station. 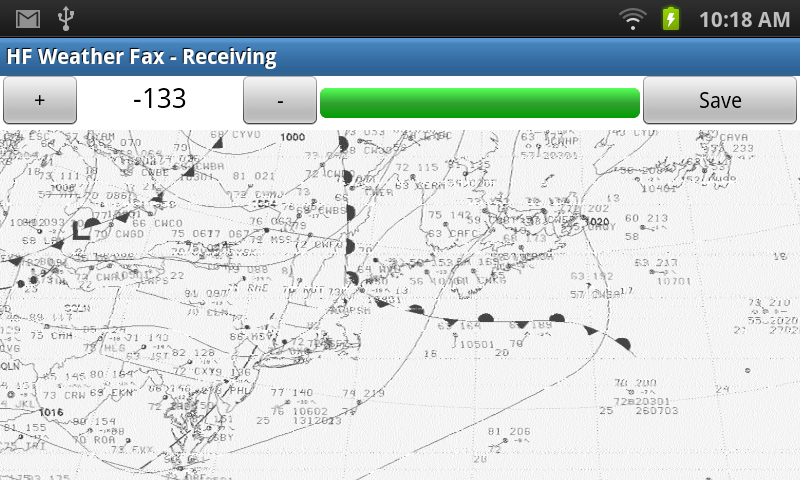 Then bring up the menu for HF Weather Fax, and select Start, to force the app to begin receiving the fax. The image will not be correctly aligned, that is, the edge will be somewhere in the middle. That's OK, we'll use the edge (a dark bar going down the screen) to adjust the slant timing. The default slant value is zero. If the received image is slanting to the right, the timing adjustment must be increased. Press the + button a few times. One the fax is no longer slanting to one side or the other, the adjustment is done The timing adjustment value will be automatically saved and used each time you run the app, so typically you only need to go through this procedure once. You can now select Stop from the app's menu, and wait for a new fax to be transmitted. When the start tone is detected, the app will automatically start decoding it. You can pinch and zoom and scroll around the image as it is being received. Start can be used to manually start reception. Note that in this case, the image will not be correctly aligned. Clear will erase the portion of the fax that has already been received. Settings brings up another screen where you can adjust the slant, as well as set auto save mode. When auto save is checked, received faxes will be automatically saved on your SD card, and copied to an album called Faxes in your Gallery. Some Android devices don't have a menu button. On some devices, this is how you bring up the menu, other devices may use a different method: if you hold the back key, the one that has the arrow making a u-turn to the left, not just a light tap but a hold press it will bring the expected menu forward. Note that proper reception of fax images and detection of the start and stop tones requires good quality reception. Weak signals, noise and other interference can make it difficult or impossible to properly decode and display a fax image. 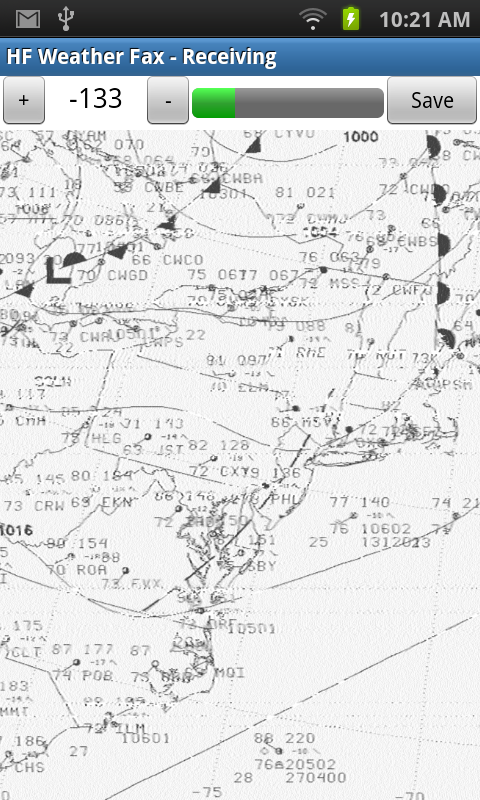 This is not a deficiency of the HF Weather Fax app, but is something that must be corrected with your radio setup. If you have any questions or comments, please contact us at support@blackcatsystems.com and we will be happy to try and help you. Note that we cannot make recommendations as to specific radios or antennas to use, or answer questions about your particular radio.